It seems utterly incredible (even inconceivable - at least for my fellow Princess Bride fans out there) that we are facing the end of October already. Where has this year gone? To soften the blow, however, there are a number of exciting new films out in cinemas next month. 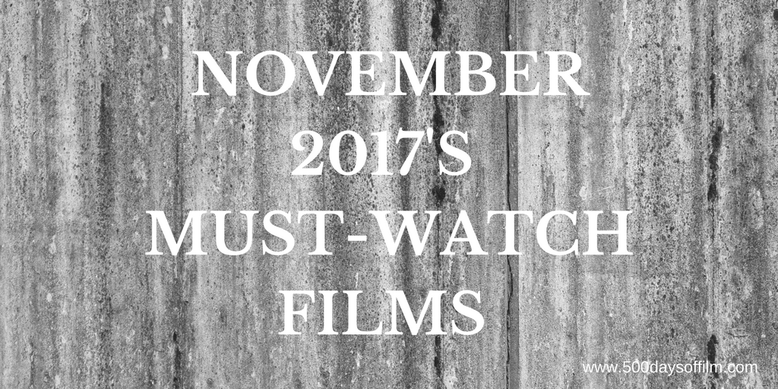 Let's take a look at November 2017's most anticipated movie releases! Why The Excitement: Any film by Kenneth Branagh is worth a watch. Combine this with a wonderful cast and a classic story by Agatha Christie (adapted by Michael Green) and you (hopefully) have all the ingredients for an entertaining film. Why The Excitement: One watch of the trailer for this sci fi romance had me hooked. Thelma tells the story of a girl who discovers that she has supernatural powers after falling in love. Why The Excitement: The first film was fun and the original cast are back - including the scene stealing Kathryn Hahn. Fingers crossed for another raucous time! Why The Excitement: Since the release of his brilliant film, The Lobster, any film by Yorgos Lanthimos is a must watch for me. Why The Excitement: Marjorie Prime looks like a fascinating film with an intriguing premise. In the world of this melancholy sci fi, a service that has been created that allows people to resurrect their loved ones in holographic form. Marjorie (Lois Smith) chooses to bring back her husband at the age at which she met him. Why The Excitement: Featuring an impressive cast, Only The Brave's powerful true story of a group of elite firefighters (called the Granite Mountain Hotshots) who risk everything to protect a town from a fearsome wildfire has already pleased audiences and critics in America. Why The Excitement: Who could resist another cinematic outing to watch the adventures of this marmalade-loving bear? Not me. However, after the success of the last film, Paddington 2 certainly has a big act to follow. Why The Excitement: This story of the life and relationships of Dr William Moulton Marston - the creator of Wonder Woman - looks fascinating. Plus it stars Rebecca Hall, which is more than enough reason for me to anticipate Angela Robinson’s film. Why The Excitement: I was fortunate enough to watch this wonderful film about a little girl growing up in the shadow of Florida’s Magic Kingdom at the BFI London Film Festival. I found it to be funny, heartbreaking and poignant. Plus Willem Dafoe is superb. Why The Excitement: So, I’ll watch pretty much anything starring Annette Bening but this film (a true story about a young actor who falls in love with a Hollywood leading lady) looks charming. Why The Excitement: I am looking forward to this crime drama - particularly following reports about Robert Pattinson’s superb performance. Why The Excitement: Cautious excitement would best describe my feelings about Justice League. If they stick with the winning Wonder Woman formula we might just have a decent film on our hands. Or two hours of bashy smashy. Why The Excitement: This looks to be a very powerful story (about two men who return from World War 2 to work on a farm in rural Mississippi where they have to adjust to post-war life and deal with racism) with an exciting ensemble cast. Starring: Aubrey Plaza, Elizabeth Olsen and O’Shea Jackson Jr.
Why The Excitement: I always enjoy Aubrey Plaza so am looking forward to this stalkery tale for our social obsessed media times. Why The Excitement: Not excitement so much as a hope for a bit of harmless, entertaining fun. Why The Excitement: Another true story about a famous tennis match - this time between world number one, Billie Jean King, and ex-champion and serial hustler, Bobby Riggs. I'm intrigued by the themes of discrimination that this film may explore. What Films Are You Most Looking Forward To? What films are you most looking forward to this November? Have I missed any must watch movies? Let me know in the comments section below or via Twitter or Facebook (@500DaysOfFilm).